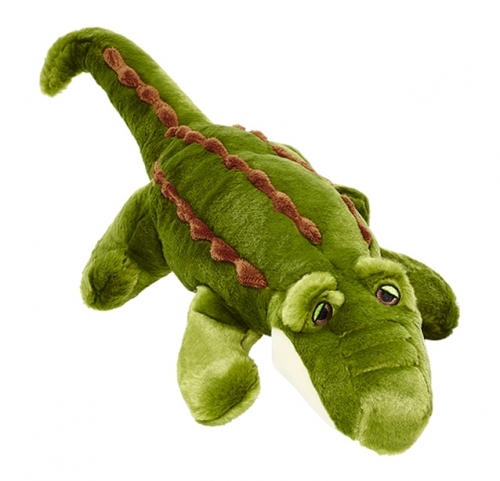 Big Daddy Gator | All Things Woof Meow, Too Inc.
Big Daddy - a extra-large version of our very popular Georgia Gator - appeals to dogs of many sizes and playing styles! Slightly understuffed, his longer body style is perfect for playing tug-of-war, shaking, squeaking and finally after all of that play, he also makes a great pillow! Fluff & Tuff dog toys are made of high quality fabrics, the outer layer is ultra-plush covering the durable, thick mesh inner liner. All seams are double stitched. A large, durable squeaker is enclosed in a stitched fabric pouch. For your dogs safety, the eyes are stitched and there are no hard edges. The stuffing is new non-toxic polyester fiber. Please supervise your dogs playtime; while these toys are very durable, they are still a plush toy and therefore, not indestructible.